Nuts and nut slots provide a number of items for discussion. Check out the article, "Nuts" for some more information on nut design. Here you can see the dark dirt and stuff in the slots. The slots themselves are a bit wide, and could allow the string to roll around a little, losing valuable vibrational energy, and possibly causing an interference buzz at the peghead. If the nut slot does not slant back down toward the peghead, the string may not ride on the leading edge toward the first fret. In that circumstance, it's very possible to generate a little buzzing or fuzzy tone. That doesn't mean the string WILL buzz, but it does give the impression that the notches weren't particularly carefully cut, and that the string may be rattle against the walls of the slot. It is not unusual for the string to rattle at the back edge of such slots, giving the symptom of a tiny whiny high pitched buzz that rings sympathetically and appears to come from the peghead. By the way, the photo is not backward. It's a lefty guitar, a Taylor 710. 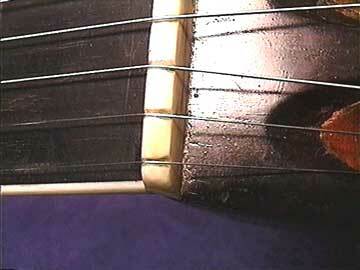 When notching nuts, it pays to be aware of the string's path behind the nut toward the tuner post. The string should bear all along the nut slot. 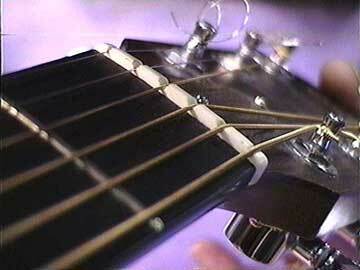 If the string is held up out of the slot at the back edge, then it can rattle against the sides of the slot. In other words, the string path across the nut should be at an angle that splits the difference between the plane of the fingerboard and that of the peghead.